﻿Go shopping in the NEW Hershey Blaze store in partnership with GTM Sportswear. Here you can find a few of the newest Heshey Blaze items for you and your family. The store also include some of Coach Paynter's new Blaze Inspiration gear, a concept designed to inspire fitness, friendship and success for everyone. Orders from the Hershey Blaze store will be shipped directly to you. The store will continue to expand, so check back to see what items will be there for your purchase. 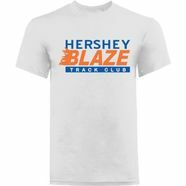 <----Click on the Hershey Blaze T Shirt to enter the store! Go shopping at the USATF online store and receive at 10% discount on all items including Nike Dri-FIT gear. All Hershey Blaze TC athletes are registered with USA Track & Field which offers members a wide range of benefits. Membership provides athletes, coaches, officials, parents and fans of track & field the opportunity to show their support of our sport while receiving a wide range of exciting benefits. The Hershey Blaze Track Club has relationships with the following vendors of athletic equipment and apparel companies.